Yesterday morning, before heading to our office, my Mom & I stopped at Casa de Luz to try their vegan, organic, macrobiotic breakfast. As many vegans know, if you are not in a vegan-friendly city, finding a place that can accommodate breakfast food can be challenging. We often have to succumb to a bowl of gloppy oatmeal, fruit, or simple toast with jam. 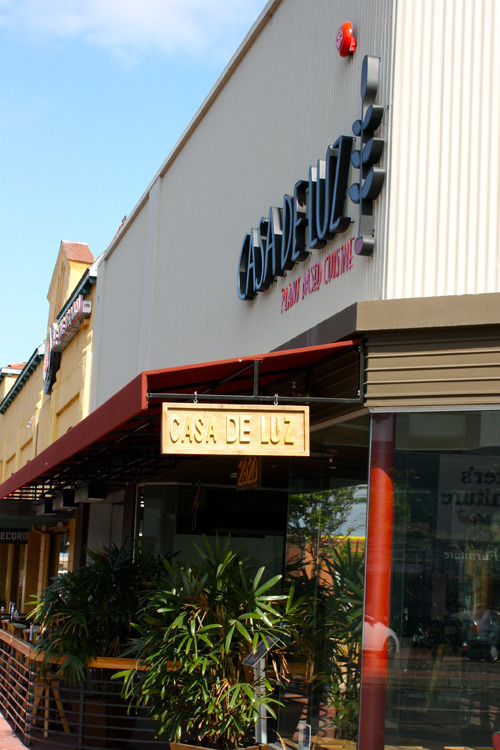 Lucky in San Diego, the vegan-friendly scene is finally beginning to thrive, & we are finding ourselves with more & more satisfying breakfast options around town at places like Ranchos Cocina, Jyoti Bihanga, Lotus Cafe Hillcrest, OB People’s Market, & now Casa de Luz. I’ve been to Casa a handful of times since it opened earlier this year (I blogged about my first experience here) – twice for dinner, once for lunch, & this morning for breakfast. The philosophy of Macrobiotics is the founding idea for Casa de Luz. The term “macrobiotic” describes a holistic lifestyle which seeks to empower individuals to establish health, & harmony in their lives, personal relationships, communities, & environment. Macrobiotics is a philosophy that aims to achieve balance & peace through awareness & common sense living – getting enough rest, eating the way nature intended, being kind & respectful towards oneself & others, & respecting the environment. Macrobiotic practitioners recommend a varied diet based on whole grains, vegetables, beans, & other organic natural foods. In addition to following the principals of macrobiotics, their plant-based cuisine is vegan, organic, & gluten-free. 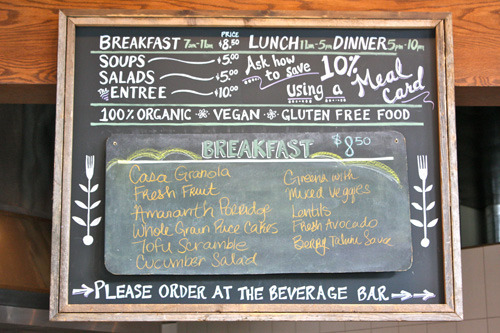 As with the lunch & dinner menus, the breakfast offerings change daily & are based upon what is seasonal & available. Breakfast is served buffet style, so dig in & load your plate. Casa’s lunch & dinner plates are a lot more expensive, so I was pleasantly surprised to find that a serve yourself breakfast plate was a bargain at $8.50. Here is the plate I made up (Mom’s was exactly the same, we are two peas in a pod!). 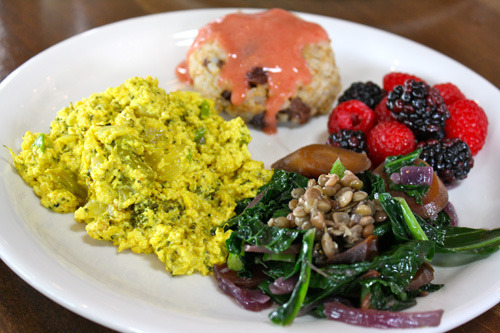 The tofu scramble was wonderful – warm, savory, & very moist (but not watery). My home scrambles tend to turn out on the drier side, so I’ll have to try to figure out how they do it. I also highly enjoyed the rice cake with the berry tahini sauce. The rice cake was reminiscent of a breakfast rice cereal, formed into a small cake, with warm cinnamon spices & juicy raisins throughout out. The sweet & creamy berry tahini sauce was lovely atop the cake. The veggies were a bit disappointing, as they were cold, & we noticed as we were cleaning up our table (you bus dishes yourself) that they’d put out avocado & warm tortillas (a tofu scramble breakfast burrito would have been tasty). 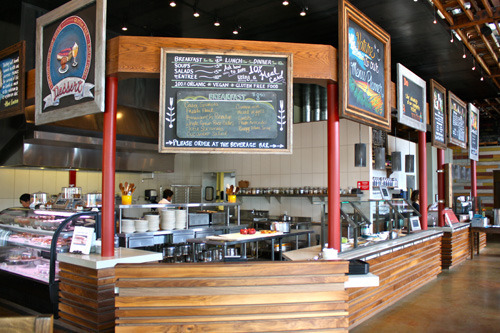 All in all, like previous experiences here we enjoyed it, & will definitely return – for breakfast, lunch, & dinner. 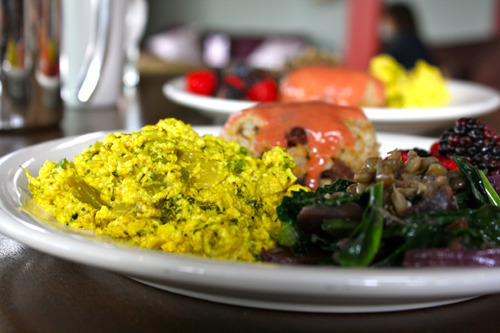 So if you are looking for a quick, healthy, vegan & inexpensive breakfast in San Diego I most certainly recommend Casa de Luz. And if you have the time, feel free to linger a while – they encourage it. 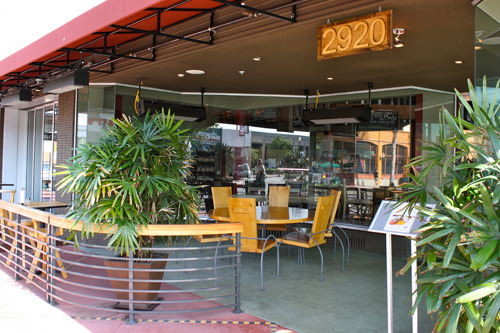 Bring a book, your laptop, or iPad, order up a French press full of rich organic coffee & enjoy a leisurely morning. I just might take them up on that this summer!